This is an exploration of shifting colours and different spaces that they inhabit. Lines. Stripes. Blocks. Geometric. Artificial. Cotton Candy. Pink. Blue. Baby Blue. Babies. Cubes. Cubic Babies? This is what I came to through days of tinkering and testing out different things. I didn't have a set plan I just sat down and tried to see what would come of it. It truly was a series of coming to my laptop everyday and failing and returning and failing to somewhat seeing shapes and distinct colours. When I set out to do this project I started trying out different things in Processing which was helpful but ultimately a mistake. I made quite a few things that I failed to successfully transfer to Openframeworks. Openframeworks can be a cruel mistress and is unforgiving. I don't feel like this is anything but an exploration. I think this piece could be improved upon. 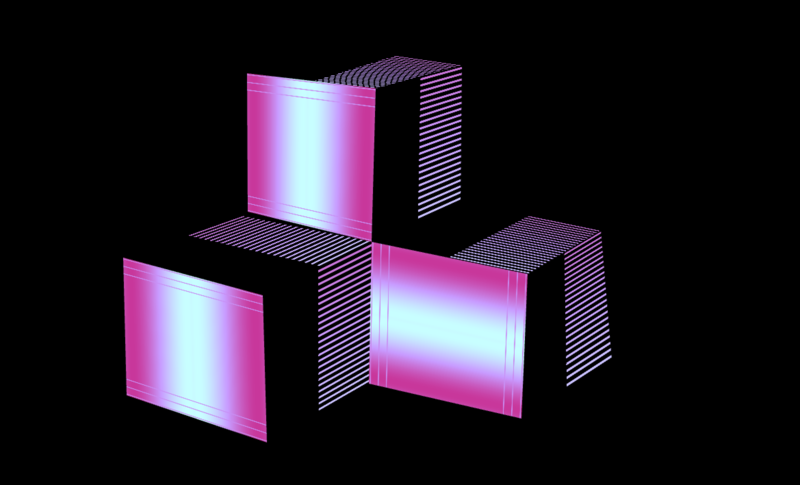 I projected onto a couple of cubes in my lounge because I was unable to project at the pop-up. I think at every stage of this project it has been a learning lesson for me. I enjoyed projecting in my lounge and at my own leisure- I threw dark blankets over the sofas and repurposed some of my housemate's moving house boxes. It was incredibly DIY but it worked and it was fun to have my housemates come through and show them what I was working on. I think I gained a valuable skill that can be applied in different situations. In the future, I would like to focus on projecting different things but this was a good exercise and exploration in limitations of space, colour, and time.